AP: Does racial bias fuel Obama foes? How to tell? Posted By:Unknown | At:6:44 PM Be the first to comment! The question of whether race fuels opposition to President Barack Obama has become one of the most divisive topics of the election. It is sowing anger and frustration among conservatives who are labeled racist simply for opposing Obama's policies and liberals who see no other explanation for such deep dislike of the president. "We're at a tipping point," said Susan Glisson, director of the Institute for Racial Reconciliation at the University of Mississippi. "But I don't know which way we're going to tip." Glisson knows that many conservatives disagree with Obama solely because of his policies. "But I am also quite certain that there are others who object to the president because of his race, because they have a fear of blacks that is embedded in our culture," she said. Her conclusion is based on something called "implicit bias"- prejudices that people don't realize they have. Studies show that due to longstanding negative stereotypes about African-Americans - which give such false impressions as most black people are dangerous, unintelligent or prefer welfare to work - many people harbor anti-black biases yet don't even know it. Such unconscious biases, the studies show, are present in people of all backgrounds, not just whites. "Our history has created this unconscious bias," said Gail Christopher, vice president of program strategy for the W.K. Kellogg Foundation, which has funded research on the subject. "Now we need to create safe places to discuss and educate people about unconscious bias, where we are not blaming and shaming them." "Every time they say, 'We want our country back,' I know what that means," Susan Bankston, a white Democratic National Convention delegate from Richmond, Texas, said at the gathering last week. "You recognize it when every time the Republicans with their own convention refer to him by his first name, Barack Obama. He's President Barack Obama," said Patt Sanders, a delegate from Englewood, Calif., who is black. Such logic inspired James Taranto, a conservative Wall Street Journal columnist, to write: "Every comment from a Republican can be translated, through a process of free association, to: 'We don't like black people.'" At their convention, Republicans made sure to show that the GOP does like black people, showcasing speeches by black and Latino conservatives. Two attendees who threw peanuts at a black camerawoman while commenting "this is what we feed animals" were swiftly ejected and denounced by GOP organizers. The actor Alec Baldwin simply tweeted: "If Obama was white, he'd be up by 17 points." Said former President Bill Clinton in his speech to the Democratic convention: "Though I often disagree with Republicans, I actually never learned to hate them the way the far right that now controls their party seems to hate our president and a lot of other Democrats." Joseph is too young to remember past GOP appeals to racial bias, such as Richard Nixon's "Southern strategy," Ronald Reagan's "welfare queens" rhetoric and George H.W. Bush's infamous Willie Horton ad. He believes Obama should have done more to promote economic growth. Yet Joseph is often called a racist when he discusses politics. 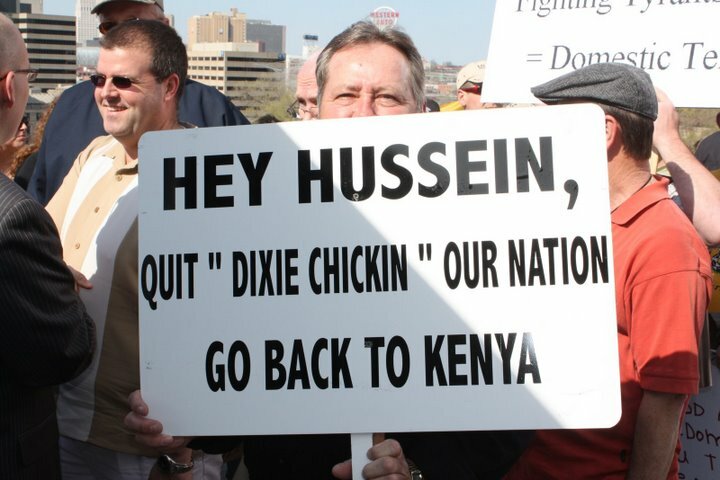 This inspired him to film a satirical video, "Bob is a Racist" (http://bit.ly/SrvPAW ), which lays bare the frustration of many conservatives. "Things have changed a lot since the 1980s," Joseph, a video journalist for a conservative media group, said in an interview. "I don't think food stamps equals blacks. We don't want people to be on food stamps, black or white." So how many conservatives are truly biased against black people? "I don't know," Joseph said. "But it's hard to figure out when one side is assuming that it's everywhere." "But there unquestionably is racism in some of the opposition," Milloy said in an interview. "And it should not just be up to black people to identify it and have to deal with it. This is an American problem. It's not just a black problem." That can be difficult for folks who don't see a problem. Joseph, for one, doesn't buy the foundational idea of unconscious bias, that America remains afflicted by a racist past. "You get in the real world, and I just don't see it," he said. For him, the bottom line is simple: "I know I'm not a racist, and the conservatives I know aren't racist." She immediately sensed a change in the atmosphere: "They didn't know that I love fried chicken." It's a common occurrence: a statement that can be interpreted either way. Evan Woodson, a black student at Oklahoma State University, often hears other black people call something racist that he sees as benign: "People seriously act as if whitey is still out to get them in 2012 in Stillwater, Okla. I don't think that's the case anymore." Woodson does believe that the legacies of slavery and Jim Crow still create disadvantages for African-Americans. But when it comes to politics, he sees racial transgressions from both parties, such as Vice President Joe Biden telling black people that Republicans "want to put y'all back in chains." "No matter how you cut it, politicians constantly seem to be accusing the other party of racism," Woodson said, and that prevents people from having honest conversations about actual racism. "People can't identify real racism anymore. They're lost in all the race-baiting." And yet: "Everyone that's white ain't no bigot," Johnson said. "Otherwise Obama never woulda become president." Jesse Washington covers race and ethnicity for The Associated Press. He is reachable at http://twitter.com/jessewashington or jwashington(at)ap.org.